Saifi Arabic Institute specializes in teaching the Lebanese Arabic Dialect, and Modern Standard Arabic (MSA) to non-native speakers working, studying, visiting or just enjoying Beirut, Lebanon. Saifi Institute offers flexible and customized group lessons for young professionals. It is active primarily in teaching non-Arabs, and Arabs who grew up overseas, to communicate easily in Arabic countries. In addition Saifi is involved in developing the grammar, vocabulary and spelling for the Lebanese dialect to be taught in a coherent and systematic curriculum. Saifi was opened in 2008 by Rana Dirani and now has a staff of three full time teachers, and several part time teachers. Saifi Institute for Arabic Language is registered with the Lebanese Ministry of Finance, and operates according to labor and intellectual property laws in Lebanon. Saifi Institute for Arabic Language was established by Rana Dirani in January of 2008 in one room with one teacher. Rana, who has been teaching Arabic since 2000, and doing mental planning for Saifi since at least 2005, finally decided to start her own school when the opportunity arose to take a room at Rootspace a shared office-space. In August 2008 Saifi expanded into is current location. Saifi teaches people from all walks of life from all over the world – journalists, NGO workers, volunteers and even Embassadors attend Saifi Institute. The school now has three classrooms and three teachers, and plan are underway for a new location. Lebanon-born Miss Michigan Rima Fakih is Miss USA 2010 ! 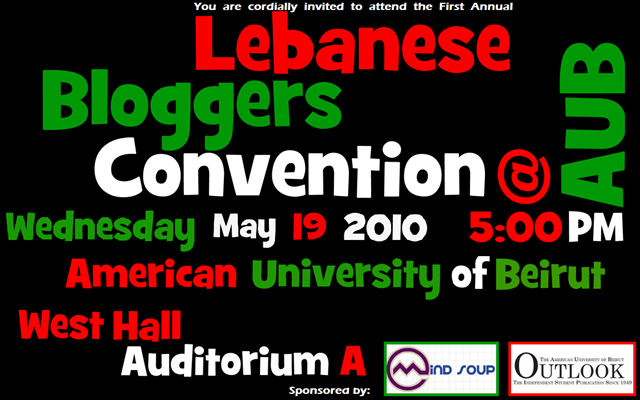 in coordination with Outlook, AUB’s official newspaper, Mind Soup is hosting the first Lebanese Bloggers Convention at AUB. During the convention/workshop, Lebanese guest bloggers will introduce the world of blogging to students and encourage them to express their ideas and opinions using personal blogs. Also on the agenda is discussing the impact of blogging on the freedom of speech in Lebanon and the effect of blogging on the Lebanese society and culture. Everyone is welcome to attend! If you are a non-AUB student and would like to attend, please send an email to moudz.mindsoup@gmail.com so that your access to AUB’s closed campus can be facilitated! Can you drive with the feet?